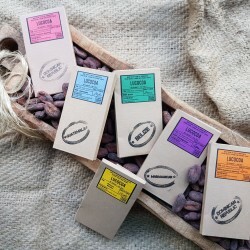 From cocoa beans to bars of chocolates, Lucocoa Chocolate are London's first chocolate makers using healthier alternatives to refined sugar such as coconut sugar and superfood lucuma. Lucocoa Chocolate ethically sources cocoa beans from around the world including Madagascar, Colombia, Belize, Guatemala and the Dominican Republic giving Lucocoa bars their unique taste. The idea was originally conceived as a result of Amarachi Uzowuru's equal passion for two things; exercise and eating! She was convinced it must be possible to create a chocolate bar that’s healthy without compromising on taste, an offering that, as the strapline says, is not naughty, just nice. Ama achieved her chocolate alchemy by replacing refined sugar with coconut sugar and lucuma. Don’t just take our word for it though, try it for yourself and let your tastebuds be the judge!